Thursday, 5 February 2015 Posted by bookshy Labels: #100DaysofAfricanReads, Bakwa Magazine, Kwani? "a series of portraits on books, writers and readers, over a 100 day period ... highlighting the work of an African author in print and online ". It wasn't only images - each photo was accompanied with a blurb about the book/story and the author. 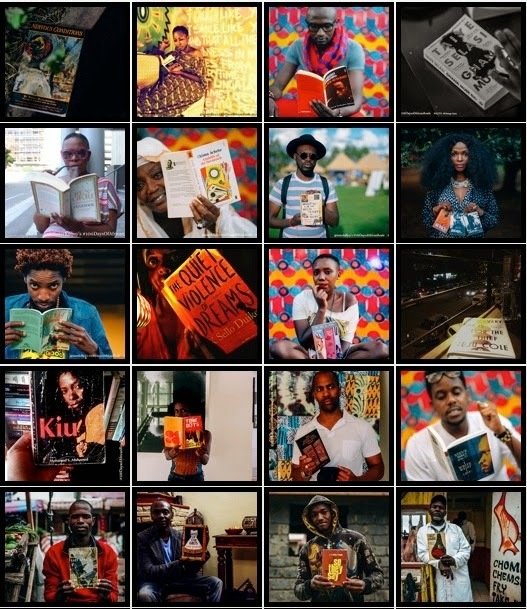 Some of the striking images from #100DaysofAfricanReads. Source: Sister Killjoy's Facebook Page. From classics (Things Fall Apart, Our Sister Killjoy, Nervous Conditions) to contemporary fiction (Open City, Ghana Must Go, Wife of the Gods) and e-books (Boy, Snow, Bird) to short pocket sized stories (easykwani) the images captured the variety of books and formats on the continent. There were also links to short stories (Teju Cole's Water Has No Enemy), essays (O Digba Ka Na’ by Michael Salu), and works from writers' collectives (Jalada) and magazines/newspapers (Chimurenga). More than that, #100DaysofAfricanReads also captured the diversity of readers - women and men, young and old, found in different parts of a city (I'm assuming the pictures were taken in cities). From the butcher holding Okot p'bitek's Africa's Cultural Revolution, to the woman in the market by the fruit and veg stand holding a copy of Two Songs (also by Okot p'bitek), to reading at night in a downtown bar/restaurant staring out onto the street, or at home, at the bustop, in the library, in your car, in the park or even on the pavement of a busy street. Even authors, like Toni Kan, Okey Ndibe, and Nike Campbell-Fatoki got in on the action holding copies of their own books Nights of the Creaking Bed, Foreign Gods., Inc and Thread of Gold Beads respectively. If it isn't already obvious, I loved everything about #100DaysofAfricanReads. Probably around two or so weeks into project, I noticed that the Cameroonian cultural magazine, Bakwa Magazine started featuring excerpts of stories related to #100daysofAfricanReads on their website. Recently, I got the chance to ask Dzekashu MacViban, founder of Bakwa magazine, a few questions on Bakwa's involvement with #100DaysofAfricanReads.
" #100daysofAfricanReads is a challenging project which Angela Wachuka was able to pull off wonderfully. It takes the world on an African writing reading spree which cuts across several genres and forms highlighting popular and not so popular works (including purchase links) all of which are introduced such that the reader has a general idea of the work in question." "Actually, the collaboration was Angela’s idea and it came about just before Bakwa published an excerpt of Awes Osman’s novel "Skinless Goat" in Somalia. After that, she said she’d very much like to feature some contemporary Cameroonian writers as part of #100daysofAfricanReads." "With the exception of the excerpt from Awes Osman’s novel, Bakwa’s contribution to #100daysofAfricanReads was made up of short stories by Cameroonian female writers Joyce Ashuntantang and Monique Kwachou. The decision to feature fiction by Cameroonian female writers of English expression is mostly because Cameroonian writing in English is not well known in the world and the writers who are internationally recognized are mostly men." I especially love that #100DaysofAfricanReads and Bakwa used this opportunity to showcase the works of female Cameroonian writers in English. It's just a testament to how through platforms like these, we are able to gain access to literary works we may not usually have access to. For me #100DaysofAfricanReads is as much about showcasing how diverse (African) literature (on the continent and in the diaspora) is and how we consume it in so many different ways, as it is about the diversity of social life in Africa - it shows that reading can, and is, for everyone. So thank you Angela Wachuka for such an awesome initiative, to the photographers (including Msingi Sasis, Michael Adesoun, Jacque Ndinda, Neo Jasmine Mokgosi [I'm sorry if I didn't get all of the names]) for such amazing visuals, and the men and women for working it in those photos. #100DaysofAfricanReads was awesome! About midway through, I was eagerly awaiting each day's post.